Limit 8 tickets per order. Cannot be combined with other offers. Subject to availability. Students with a valid ID can purchase $10 tickets in advance. Box office sales only. Limit two tickets per ID, one ID per person. Offer is subject to availability and may be discontinued at any time. 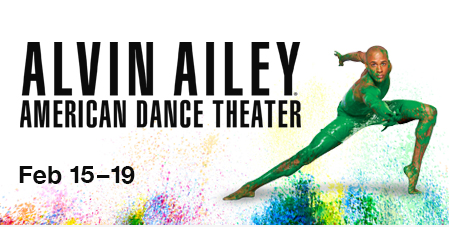 Join us for two days of special technique classes with live accompanists and an in-depth study of Alvin Ailey’s classics with his masterpiece, Revelations, featuring traditional spirituals and gospel songs that are essential to Mr. Ailey’s work. No experience necessary and all levels are welcomed!